VETERAN prop Denford Mutamangira was yesterday named the Zimbabwe Sables captain and immediately declared that the senior side would have to cover a lot of ground ahead of their Africa Cup rugby showdown against Kenya this weekend. Just two days after turning 31, Mutamangira was unveiled as the Sables skipper, taking over from Harare Sports Club and Cheetahs coach Daniel Hondo who resigned from international rugby at the end of the failed Sables World Cup qualifier last year. Mutamangira who is also the Harare Sports Club loose-head prop is under no illusion about the task awaiting his team and believes in as much as the Sables did not get as much exposure as they would have wanted due to lack of resources, it is now time for them to focus and work with what is available. “It’s an honour for me that I have been appointed captain of Zimbabwe rugby. It was something I was not really expecting but I feel this is a good thing not only for me but for all those who helped me to be where I am today. 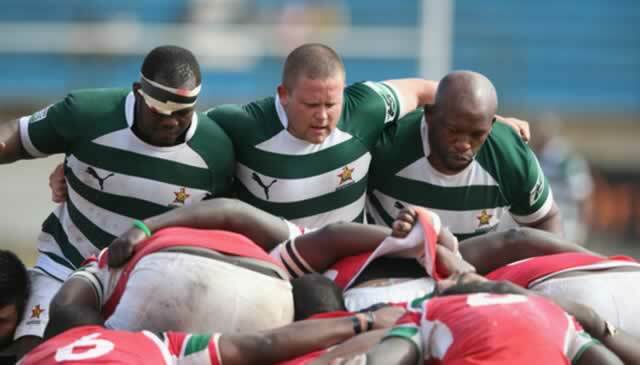 “Of course we (as Zimbabwe rugby) might not have as much (financial) resources as we might need but I believe it’s now time for us to focus on the job at hand and that is making sure we work hard and play better than Kenya,” said the former AYR prop. The former Churchill Boys High student pupil is one of the most experienced players in the Sables squad having played for Harare Sports Club for a number of years before he moved to AYR in Scotland where he won several titles with the side including a double in 2013. This was also the same year he won the Scottish Premiership Rugby title with AYR. He is also an Africa Cup winner with the Sables. Sables coach Cyprian “Supa” Mandenge yesterday spoke highly of the front-rower saying he has a lot of quality attributes that he admires about seasoned forward including good leadership skills that he has exhibited over the years. This is not the first time that the duo is working together having first met at Harare Sports Club almost 10 years ago where Mandenge was one of the coaches while Mutamangira was just graduating from high school. “I have worked with him for a long time and he has proven to be a humble guy, he has good leadership skills and I have no doubt he will lead the team to greater heights. “Obviously his experience comes into play as well. He has played at the highest level here in Zimbabwe and in Scotland where he won a number of silverware with AYR Rugby Football Club. He has been an integral part of the Sables since his debut. “Not to say that he was the only one with such qualities but he stands out,” said Mandenge. The Sables got into camp yesterday and will be training three times a day until their battle with Kenya on Saturday with their morning session running from 7.30am to 8.45am. Another mid-morning training is scheduled before they complete the day with an evening session set for 4pm to 5pm at Prince Edward School. South Africa-based fly-half Lenience Tambwera who plays for Valke, Scottish-based flanker Andrew Rose, Lawrence Clemenson and the Germany duo of Tafadzwa “MaRubber” Chitokwindo and Antipas Kamkwindo are also part of the Sables. However, Mutamangira feels that Kenya have improved judging from the game in which they beat Portugal 41-15 last weekend as well the last time he played against them in last year’s World Cup qualifiers staged in Madagascar. “They showed that they were really working on their game and their win over Portugal showed what they are capable of doing so we have to take our practice sessions very seriously this week. It’s not just about this week’s game against Kenya we know that we have to stay in Group 1A and our aim is to make it for the 2019 World Cup, the race starts now and it’s a long journey we have to take it step by step,” said Mutamangira.